To the best of my knowledge, DeJur didn't actually make anything, they were an importer / distributor of items branded under their own name. 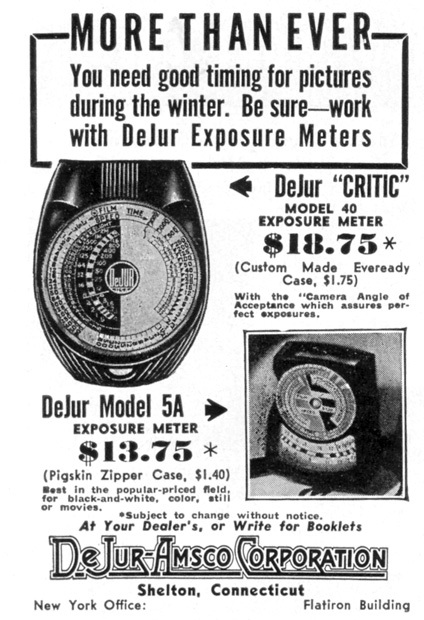 They were most well known in the 40s and 50s for amateur movie equipment, but they dabbled in other things like enlargers, meters, and the occasional still camera. In the 60s the company went into office photocopiers, and sold out in 1974 when the owners, Harry and Ralph DeJur, retired. This appears to be a domestically made Hickok. It's very close to my Photrix SS and to a lesser extent my Duplex. They're about the same size and weight. The meter is inside the dial, and on both this and the Photrix, you have to turn the glass itself so that the pointer lines up with the exposure index, and then turn the dial ring so that the pointer lines up with the hash mark that the meter needle is pointing to. The ad linked here is for a Model 40 "Critic," but it's the same meter. The difference is that the Model 40 was calibrated in Weston numbers and this Model 50 uses ASA. 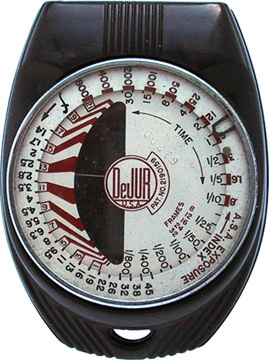 DeJur did the same thing with their simple Model 5 meter: the A version is Weston, the B is in ASA.